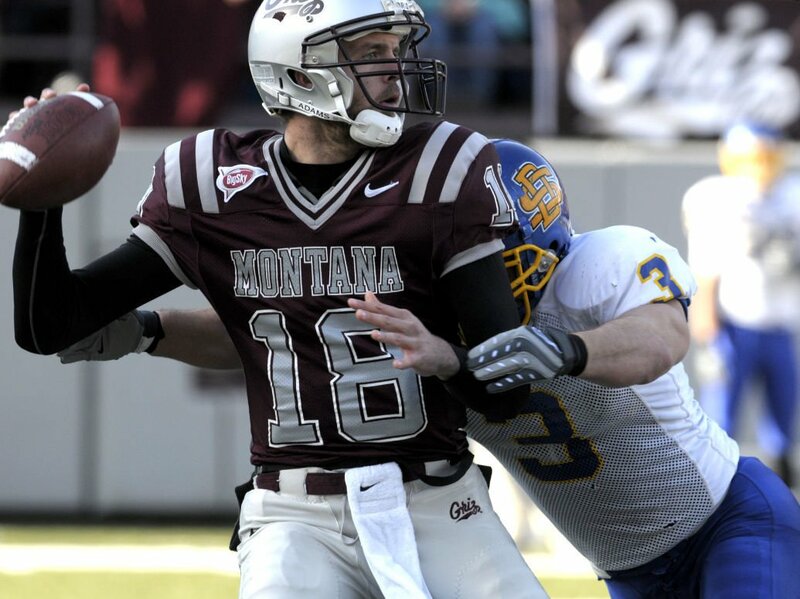 The last time Montana played South Dakota State in the playoffs, things looked bleak for the Griz as they fell behind by 27 points (48-21) with just over five minutes left in the third quarter. Than the Griz went on a 40-point explosion to win the game 61-48 and advance all the way to the championship game before falling to Villanova. Montana running back Chase Reynolds struggles for yardage against South Dakota State LB Isaiah Jackson in 2009. Reynolds had only 35 yards on 13 carries but scored three times. After a shaky first half, Montana quarterback Andrew Selle threw for 309 yards and three touchdowns. Montana defenders Erik Stoll, 4, and Trumaine Johnson, 2, combine to tackle SDSU running back Kyle Minett. South Dakota State's Cole Brodie intercepts a pass intended for Sam Gratton. Montana free safety Shann Schillinger closes in on SDSU's quarterback Thomas O'Brien. Linebacker Alex Shaw gathers a fumble. Alex Shaw and the rest of the Montana defense celebrate a fumble recovery. Tyler Palmer, 81, and Marc Mariani celebrate a touchdown reception by Palmer. Colin Cochart grabs one of his three touchdowns in the game in front of Shann Schillinger. The Montana defense swarms SDSU running back Kyle Minett. South Dakota State's Kyle Minett tries to stop Montana's Shawn Lebsock by the facemask the last time the teams met in 2009, another first-round FCS playoff game. Sam Gratton looks for running room after a catch. Marc Mariani has a pass broken up. South Dakota State blocks a punt and returns it for a score in the third quarter. Andrew Selle throws a pass. Montana's Severin Campbell chases SDSU quarterback Thomas O'Brien. Campbell had four tackles and returned an interception for a touchdown. Marc Mariani gets by the last tackler on his way to a 98-yard kickoff return for a touchdown to spark Montana's comeback. Montana tight end Dan Beaudin manhandles SDSU's Derek Domino. Shann Schillinger tries to pry the ball loose. Chase Reynolds heads toward the end zone from short yardage. Montana fans start to feel the win. SDSU's Aaron Rollin tries to escape Montana's Tim Anderson. Tyler Palmer makes one of his six receptions in the game. Tyler Palmer leaves a pack of SDSU defenders behind after a catch. Chase Reynolds stretches for another hard-fought gain. Montana coach Bobby Hauck welcomes Marc Mariani to the sideline after a score. Severin Campbell returns an interception for a touchdown to make the final score 61-48 and seal one of the greatest comebacks in Montana history. Marc Mariani and Chase Reynolds celebrate Montana's 2009 playoff comeback against South Dakota State. Montana coach Bobby Hauck hugs one of his players after the game. Coach Bobby Hauck carries his boy off the field after the post-game celebration. Montana running back Chase Reynolds struggles for yardage against South Dakota State LB Isaiah Jackson in 2009 in Missoula.